The U.S. government, determined to extradite and try Julian Assange for espionage, must find a way to separate what Assange and WikiLeaks did in publishing classified material leaked to them by Chelsea Manning from what The New York Times and The Washington Post did in publishing the same material. There is no federal law that prohibits the press from publishing government secrets. It is a crime, however, to steal them. The long persecution of Manning, who on March 8 was sent back to jail for refusing to testify before a grand jury, is about this issue. If Manning, a former Army private, admits she was instructed by WikiLeaks and Assange in how to obtain and pass on the leaked material, which exposed U.S. war crimes in Afghanistan and Iraq, the publisher could be tried for the theft of classified documents. The prosecution of government whistleblowers was accelerated during the Obama administration, which under the Espionage Act charged eight people with leaking to the media—Thomas Drake, Shamai Leibowitz, Stephen Kim, Manning, Donald Sachtleben, Jeffrey Sterling, John Kiriakou and Edward Snowden. By the time Donald Trump took office, the vital connection between investigative reporters and sources inside the government had been severed. Manning, who worked as an Army intelligence analyst in Iraq in 2009, provided WikiLeaks with over 500,000 documents copied from military and government archives, including the “Collateral Murder” video footage of an Army helicopter gunning down a group of unarmed civilians that included two Reuters journalists. She was arrested in 2010 and found guilty in 2013. The campaign to criminalize whistleblowing has, by default, left the exposure of government lies, fraud and crimes to those who have the skills or access, as Manning and Edward Snowden did, needed to hack into or otherwise obtain government electronic documents. This is why hackers, and those who publish their material such as Assange and WikiLeaks, are being relentlessly persecuted. The goal of the corporate state is to shroud in total secrecy the inner workings of power, especially those activities that violate the law. Movement toward this goal is very far advanced. The failure of news organizations such as The New York Times and The Washington Post to vigorously defend Manning and Assange will soon come back to haunt them. The corporate state hardly intends to stop with Manning and Assange. The target is the press itself. Manning has always insisted her leak of the classified documents and videos was prompted solely by her own conscience. She has refused to implicate Assange and WikiLeaks. Earlier this month, although President Barack Obama in 2010 commuted her 35-year sentence after she served seven years, she was jailed again for refusing to answer questions before a secret grand jury investigating Assange and WikiLeaks. 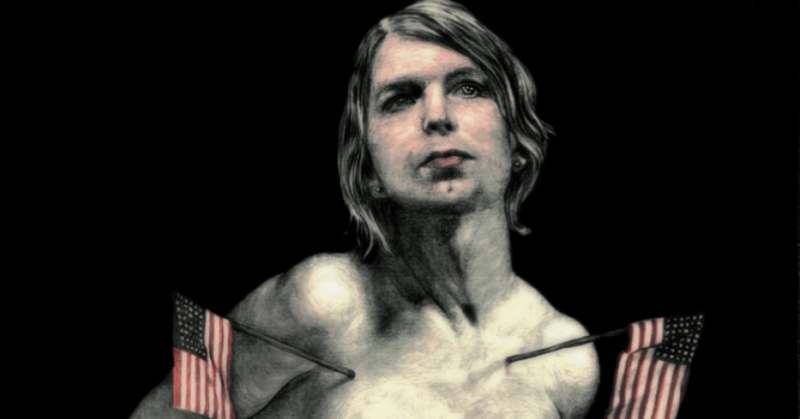 While incarcerated previously, Manning endured long periods in solitary confinement and torture. She twice attempted to commit suicide in prison. She knows from painful experience the myriad ways the system can break you psychologically and physically. And yet she has steadfastly refused to give false testimony in court on behalf of the government. Her moral probity and courage are perhaps the last thin line of defense for WikiLeaks and its publisher, whose health is deteriorating in the Ecuadorian Embassy in London, where he has been holed up since 2012. Manning—who was known as Bradley Manning in the Army—has undergone gender reassignment surgery and needs frequent medical monitoring. Judge Claude M. Hilton, however, dismissed a request by her lawyers for house arrest. Manning was granted immunity by prosecutors of the Eastern District of Virginia, and because she had immunity she was unable to invoke the Fifth Amendment protection against self-incrimination or to have her attorney present. The judge found her in contempt of court and sent her to a federal facility in Alexandria, Va. Hilton, who has long been a handmaiden of the military and intelligence organs, has vowed to hold her there until she agrees to testify or until the grand jury is disbanded, which could mean 18 months or longer behind bars. Manning said any questioning of her by the grand jury is a violation of First, Fourth and Sixth Amendment rights. She said she will not cooperate with the grand jury. “All of the substantive questions pertained to my disclosures of information to the public in 2010—answers I provided in extensive testimony, during my court-martial in 2013,” she said on March 7, the day before she was jailed. The New York Times, Britain’s The Guardian, Spain’s El País, France’s Le Monde and Germany’s Der Spiegel all published the WikiLeaks files provided by Manning. How could they not? WikiLeaks had shamed them into doing their jobs. But once they took the incendiary material from Manning and Assange, these organizations callously abandoned them. No doubt they assume that by joining the lynch mob organized against the two they will be spared. They must not read history. What is taking place is a series of incremental steps designed to strangle the press and cement into place an American version of China’s totalitarian capitalism. President Trump has often proclaimed his deep animus for news outlets such as The New York Times and The Washington Post, referring to them as the “enemy of the people.” Any legal tools given to the administration to shut down these news outlets, or at least hollow them of content, will be used eagerly by the president. The prosecutions of government whistleblowers under the Espionage Act, warrantless wiretapping, monitoring of the communications of Americans and the persecution of Manning and Assange are parts of an interconnected process of preventing any of us from peering at the machinery of state. The resulting secrecy is vital for totalitarian systems. The global elites, their ruling ideology of neoliberalism exposed as a con, have had enough of us examining and questioning their abuses, pillage and crimes. It is only through encryption that we can protect ourselves, the authors argue, and only by breaking through the digital walls of secrecy erected by the power elite can we expose the abuses of power. But ultimately, they say, as the tools of the state become more sophisticated, even these mechanisms of opposition will be difficult and perhaps impossible to use. That is where we are headed. A few resist. Assange and Manning are two. Those who stand by passively as they are persecuted will be next.